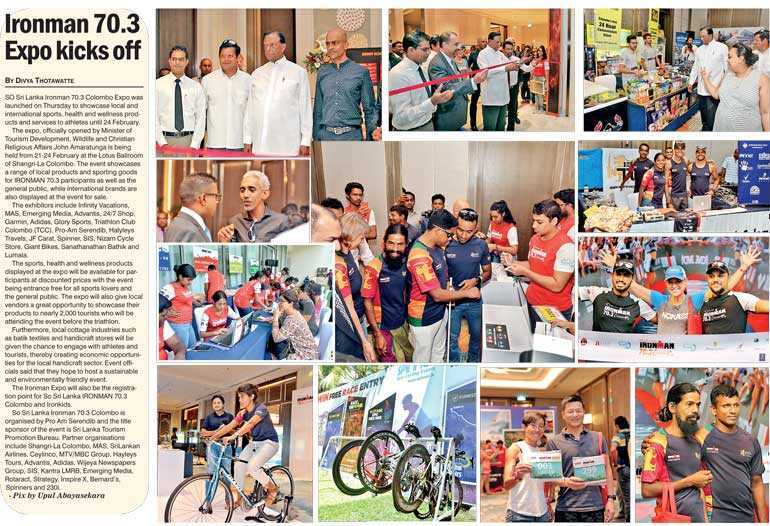 So Sri Lanka Ironman 70.3 Colombo Expo was launched on Thursday to showcase local and international sports, health and wellness products and services to athletes until 24 February. The expo, officially opened by Minister of Tourism Development, Wildlife and Christian Religious Affairs John Amaratunga is being held from 21-24 February at the Lotus Ballroom of Shangri-La Colombo. The event showcases a range of local products and sporting goods for IRONMAN 70.3 participants as well as the general public, while international brands are also displayed at the event for sale. The exhibitors include Infinity Vacations, MAS, Emerging Media, Advantis, 24/7 Shop, Garmin, Adidas, Glory Sports, Triathlon Club Colombo (TCC), Pro-Am Serendib, Halyleys Travels, JF Carat, Spinner, SIS, Nizam Cycle Store, Giant Bikes, Sanathanathan Bathik and Lumala. The sports, health and wellness products displayed at the expo will be available for participants at discounted prices with the event being entrance free for all sports lovers and the general public. The expo will also give local vendors a great opportunity to showcase their products to nearly 2,000 tourists who will be attending the event before the triathlon. Furthermore, local cottage industries such as batik textiles and handicraft stores will be given the chance to engage with athletes and tourists, thereby creating economic opportunities for the local handicraft sector. Event officials said that they hope to host a sustainable and environmentally friendly event. The Ironman Expo will also be the registration point for So Sri Lanka IRONMAN 70.3 Colombo and Ironkids. So Sri Lanka Ironman 70.3 Colombo is organised by Pro Am Serendib and the title sponsor of the event is Sri Lanka Tourism Promotion Bureau. Partner organisations include Shangri-La Colombo, MAS, SriLankan Airlines, Ceylinco, MTV/MBC Group, Hayleys Tours, Advantis, Adidas, Wijeya Newspapers Group, SIS, Kantra LMRB, Emerging Media, Rotaract, Strategy, Inspire X, Bernard’s, Spinners and 230i.